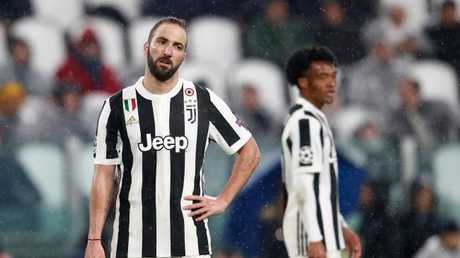 Juventus was pushing hard to find an equaliser at home against Real Madrid in the UEFA Champions League quarter-finals. Cristiano Ronaldo had put the 2016 and 2017 European champions ahead after just three minutes with his 38th goal of the season. The megastar made a deft late run into the box, caught the usually frugal Juve defence napping, and expertly turned home Isco's cross. Already, the football world was praising the Portuguese's ability to score on the biggest stages possible. His opening strike was a goal in his 10th consecutive UCL game, stretching back to last season's final against Juve. It was his 21st goal in 19 UCL quarter-finals - more than No.2 and No.3, Lionel Messi and Raul, combined. He scored a hat-trick against Paris Saint-Germain in the last UCL round. But then, Ronaldo, somehow, found another level. In the 64th minute, world football stopped and gasped. 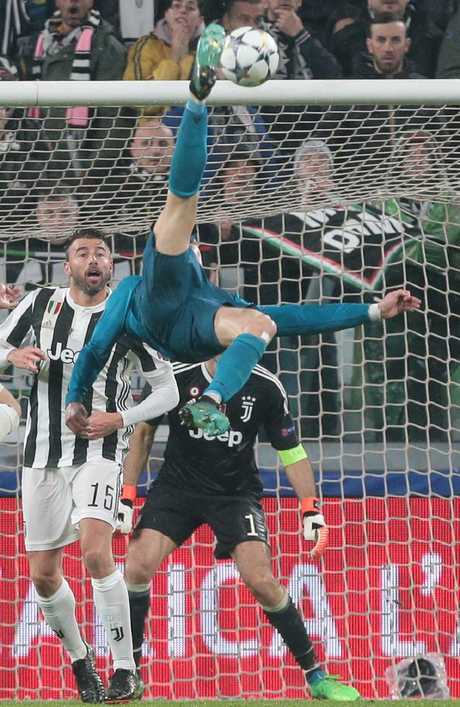 It had just witnessed a goal that will be talked about for eternity, a leap of such elastic perfection and sense of occasion that, really, only one man on the planet is capable of producing it. Even his boss, Zinedine Zidane, who has one of this competition's other most iconic goals in his CV, from the 2002 final against Bayer Leverkusen, was left scratching his head in disbelief. "I am the coach, but I am a football fan," Zidane said. "But when I see something like Cristiano Ronaldo's goal, that is just a natural reflex. I am just so happy he's on our team." Of Real's 26 UCL goals this season, he has scored 15 and assisted three, including the key pass as Marcelo added insult to injury to round out the resounding 3-0 scoreline. 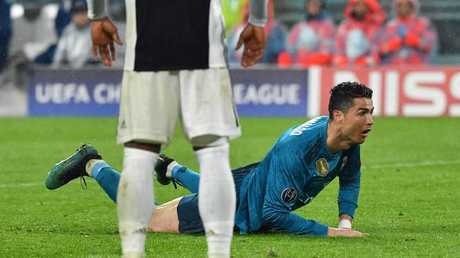 For context of the magnitude of the goal, and this result, it is the first time Juventus has leaked three goals in a home UCL knockout tie since 1999, in a loss to Manchester United. Scoring three in Turin is unheard of - they'd only conceded in four games in their past 25 outings in Serie A and Europe! Is it any wonder Los Blancos, despite a poor domestic campaign in La Liga, is in a position to become the first club since Bayern Munich from 1974-75-76 to win three successive European titles. 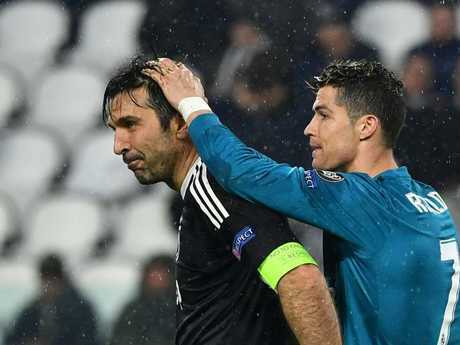 Strangely, a miscommunication between Gianluigi Buffon and Giorgio Chiellini sparked the mess in Juve's boss that saw the veteran make a scrambling save before Dani Carvajal teed up Ronaldo for his acrobatics. Real Madrid's Portuguese forward Cristiano Ronaldo (C) - you can’t see it enough. 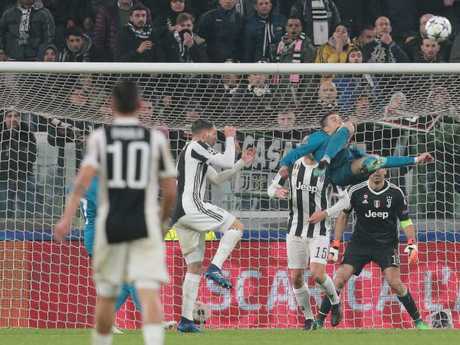 Then, Ronaldo came within centimetres of a hat-trick after a Andrea Barzagli error. The No.7 showed he is human, missing two excellent chances to nab a treble. First, he was denied by Buffon, then he unbelievably missed from close range after Lucas Vazquez crossed to him in a perfect position. 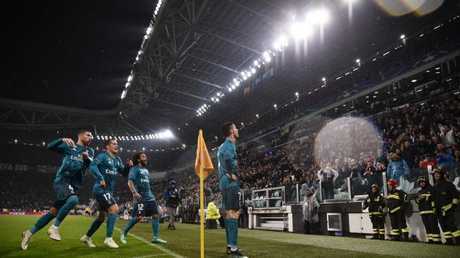 The importance of Ronaldo's goal came as Juventus pushed to cancel out Real Madrid's third-minute opener. The Serie A powerhouse would have thought they would leave for Spain with a result. Instead, their tie collapsed. Earlier, the Italians had found success turning the tide of the game with impressive pressing on Zidane's midfield. Keylor Navas had to make a fine stop to thwart Gonzalo Higuain in the 22nd minute, and Chiellini fluffed a super chance from a corner. Paulo Dybala was lively before he was sent off in the 66th minute for a second yellow. He had been booked in the first-half for simulation, then controversially marched for an aerial challenge with Carvajal as things unravelled after Ronaldo's second. Then, in stoppage time, Juan Cuadrado should have given Juve a lifeline but botched a great chance. The only downside for Real ahead of the return leg on Thursday, April 12 (AEST) is a suspension for Sergio Ramos. Elsewhere, Bayern Munich needed a couple of lucky bounces to prevent Sevilla from pulling off another Champions League upset. After being outplayed by the hosts early on and conceding a 32nd-minute opener by Pablo Sarabia, Bayern came from behind to beat Sevilla 2-1 in the first leg of their quarter-final thanks to an own goal by Jesus Navas and a second- half header by Thiago Alcantara. Both times the ball deflected off a defender to take Sevilla goalkeeper David Soria out of play. Real Madrid's Portuguese forward Cristiano Ronaldo (C) can’t even believe it. Cristiano Ronaldo of Real Madrid. Unbelievable. 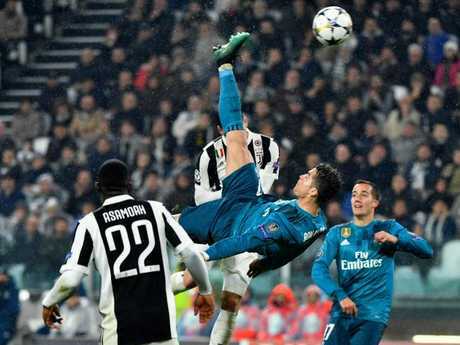 Cristiano Ronaldo of Real Madrid’s acrobatics.